Murchison Hume is an AMAZING ethical brand that I have only recently discovered (I’ll tell you more in a coming post). 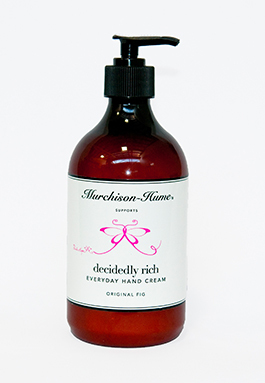 For the month of October they introduced a limited edition “Decidedly Rich” everyday hand cream with 50% of the profits going to their charity partner Pink Hope. We know there are only a few days left to purchase, but we wanted to share it with you. The wonderfully rich hand cream is blended with organic fruit and rose hip oils and best of all doesn’t contain any parabens, phthalates or silicones. RRP is AU$26.95 for 500ml.